Capture more. Access the inaccessible. Achieve true biological insight. The Genesis System for True Biological Insights. Imagine how much you could accomplish using single cell analysis once you achieve >70% capture sensitivity and nearly 100% cell viability. With the Genesis System, there is no need to just imagine the possibilities. 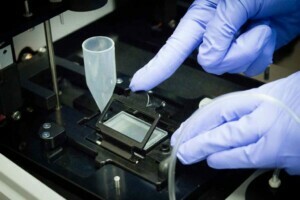 A better approach to capturing cells. Using the power of gravity and Celsingle™ micro-analysis slides, the Genesis System gently captures and isolates individual cells. Gone are harsh fluidics or droplet encapsulation that cause cellular stress. Instead, you capture a greater percentage of individual cells—including rare cells—with improved viability and structural integrity. The Genesis System is a practical solution for understanding and monitoring cell-based diseases whether users are interested in studying hundreds or millions of cells from a single sample. One sample. Hundreds to millions of cells. One solution for single cell analysis. Celsee’s Genesis system uses proprietary Celsingle™ micro analysis slides to capture and isolate individual cells. Celsingle slides have the capacity for up to 1 million cell isolation micro-wells. The Genesis system automates the process of cDNA synthesis pairing each cell with a unique cellular barcode and unique molecular indices for downstream analysis. Thanks to a patented automated reagent delivery system, lysis and reverse transcription are performed directly in the wells. Available with up to 1 Million Celsingle™ micro analysis wells. Flexibility in sample type, from blood to tissue to cell suspensions. Detect 100s of proteins on 100,000s of single cells. The more cells you capture the more you can accomplish. With the Genesis System you can capture 100s of proteins on 100,000s of cells – including those all-important rare cells. Evaluate therapies with a broader view-including rare cells. With the Genesis System, you’ll get a broader view of the cells in a sample greatly improving your ability to monitor the immune system and the effects of cell therapies and immunotherapies. Celsingle™ micro analysis slides overcome limitations of current workflows. Introducing the 1M Celsingle™ Slide. Scale meets feasibility. View cells in their natural state with the Celsingle™ micro analysis slide. Celsingle slides can be imaged to determine capture efficiencies, sample viability and quality, population analysis and monitor responses to perturbations.